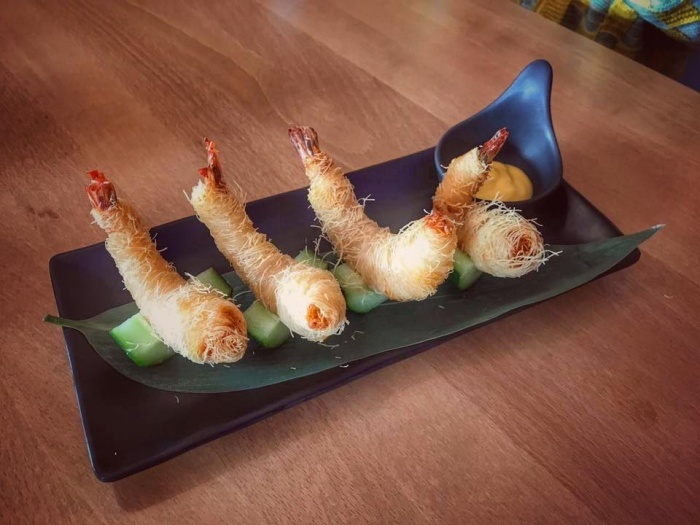 There’s a saying that good things come in small packages and it’s certainly true of one of the new Edinburgh Japanese restaurant in the West End where the delicious food is freshly prepared to order. We were greeted on arrival by a friendly waitress who quickly took and served our drinks order before stepping aside whilst we (painfully slowly) chose our food. I’m sure we’ve all had times when we can’t make a decision between two items on the menu because they’re equally tempting, but the number of tempting dishes on this menu was almost too much for us to take. My lack of decisiveness resulted in my choosing three of my long term favourites – pan fried vegetable gyoza, chicken gyoza and a tempura prawn and avocado hand roll. The pastry on the gyoza was crisp and golden on one side and soft yet dense on the other with a wonderful juicy centre. The avocado in the hand roll was perfectly ripe, the tempura crisp and the nori wrap had a wonderfully delicate crunch. The only warning we’d give about the restaurant is that on one occasion we were served crab sticks instead of snow crab. One of my dining companions chose a bento box with a mixture of sushi, sashimi, rice, noodles and a bowl of delicately salty miso soup, all of which were declared delicious, whilst my other dining companion chose a beef broth with noodles. The flavour of the broth was clean and refreshing with fresh crisp vegetables and the choice of added chilli for those who like a bit more spice. The furniture in the restaurant isn’t luxurious, but it’s comfortable and clean and the food more than makes up for it – a hidden gem which we suspect (and hope) will become hugely popular – we’ll certainly be back (often)! Do you agree with our restaurant review rating for Chizuru Tei? Add your own score for this restaurant below!